For only the third time since 1940, the winner of the national popular vote for Congress failed to take control of the House of Representatives. The Democrats won a slim majority of the (two-party) vote, 50.2%, but failed to gain back the House, winning just 197 of the 431 seats currently decided,* or 45.7%. 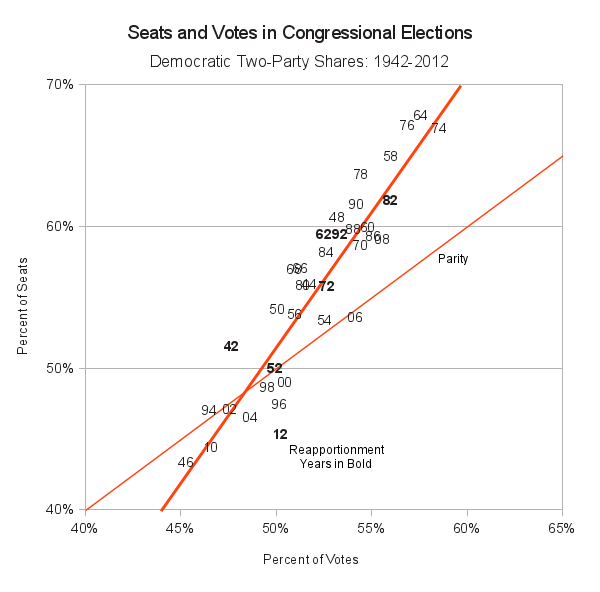 This is the largest adverse gap between the Democratic Party’s share of seats and its share of votes since the New Deal. For most of the years between 1942 and 1994, the Democrats enjoyed a “bonus” in terms of the seats they were awarded in the House of Representatives. A good portion of that bonus came from the workings of our electoral system. Political scientists and statisticians have long known that the method of voting used in Congressional elections, called “plurality voting” or “first-past-the-post,” exaggerates the size of majorities in the elected assembly. A party that wins 51% of the vote gains more than 51% of the seats, and the bonus increases as the party’s share of the popular vote grows. ** This is not a uniquely American phenomenon; we see the same exaggeration at work in countries like the United Kingdom which also employ plurality voting. The bonus is quite evident if we plot the share of seats won by the Democrats against their share of the (two-party) popular vote. The actual relationship between seats and votes is much steeper than the “parity” line which awards a party a share of the seats equal to its share of the vote. 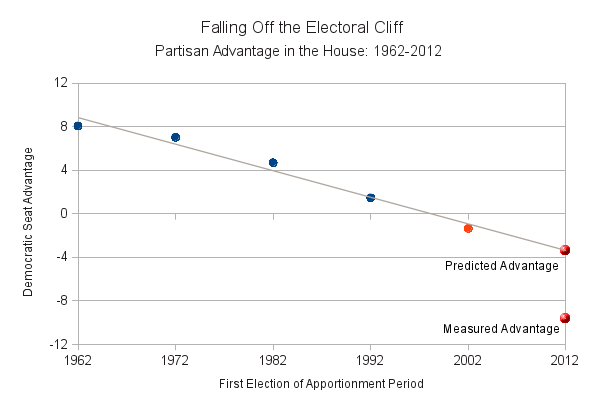 Much of the Democratic advantage we saw in the first graph reflects this feature of our electoral system. 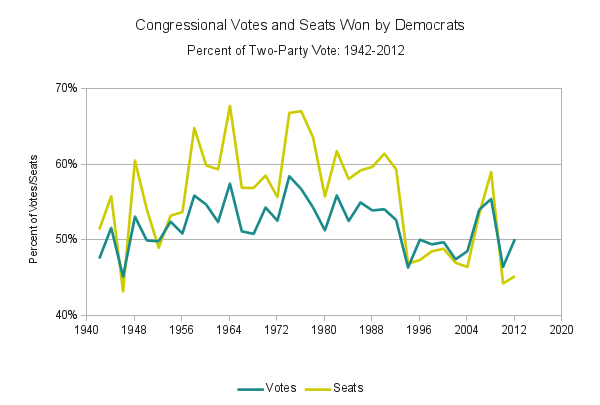 In the time-series plot we see the Democrats winning dramatically oversized House majorities in 1974 and 1976, but in the context of this historical relationship between seats and votes, those elections are not out of line. I will use this relationship between seats and votes to see how Congressional reapportionment shifted the balance of power in the House. The long-term relationship gives us a method for estimating how many seats the Democrats should have won given their share of the popular vote. We can then look at the differences between these estimates and the actual share of seats won to measure any partisan bias. 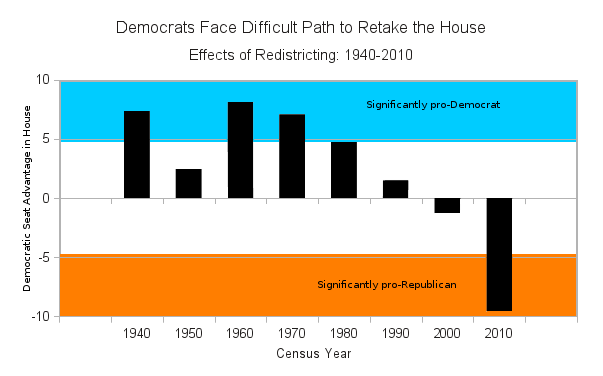 Reapportionment by itself can change the partisan balance of the House. As populations shifted from the Northeast to the Southwest, the fixed size of the House at 435 Members meant that seats in Democratic bastions like Massachusetts and New York were transferred to Republican strongholds like Texas. What draws more attention from citizens and pundits alike is the possibility of partisan gerrymandering. American political institutions grant parties enormous power to mold the structure of electoral competition. Every ten years Constitutionally-mandated reapportionment requires state governments to redraw the boundaries of Congressional districts. Nine states use a nonpartisan commission to draw district lines. Of the remaining 41, the state legislature and governor have full control of the redistricting process in 28 of them. The other thirteen states use a “hybrid” approach with a commission that is usually subservient, and sometimes purely advisory, to the elected state legislature. These institutions invest an enormous amount of power in one specific set of state legislators and governors, those elected in a year ending in zero. These partisan elected officials have the power to structure competition for the House of Representatives for the decade to come. The development of sophisticated computer software combined with geographic marketing databases places enormous power in the hands of determined modern gerrymanderers. One way we might begin the measure the extent of partisan gerrymandering is to look at whether individual “apportionment periods,” the five elections conducted in the same seat boundaries, showed a bias toward one party or another. We can use the seats/votes relationship to provide a baseline expectation of what seat outcomes ought to be, then calculate the average deviation for each five-election apportionment period like this. I date apportionment periods by the date of the Census, so the 1940 apportionment covers elections held from 1942 through 1950. The vertical bars measure the difference between the average number of seats the Democrats won in the five Congressional elections following each Census and the number of seats they “should” have won in that period based on their share of the popular vote. Remember that this technique already accounts for the bonus resulting from our plurality-voting electoral system. These bars measure any additional partisan bias associated with a particular apportionment period. The electoral system showed a distinct pro-Democratic bias of five to eight seats for most of the period between the New Deal and the 1990s. The only exception came in the 1950s when the bonus fell to an estimated two seats, a value not statistically different from zero. The Democrats’ bonus began to slip after 1960 and has moved in the Republicans’ direction ever since. Extrapolating the pro-Republican trend from 1960 through 2010 would predict an advantage for the GOP of about three or four seats in 2012. The actual Republican bias in 2012 looks closer to ten seats. Not an auspicious start to the decade ahead if you are a Democrat. While many commentators have pointed to Republican gerrymandering as the primary explanation for this result, I want to take things a bit more slowly and consider first how the process of reapportionment itself may have altered the balance of power in the House by shifting seats from Democratic states to Republican ones. I begin that discussion in the next post.